Full 24 volt Gauge Set. Volt & 60 Psi specific. 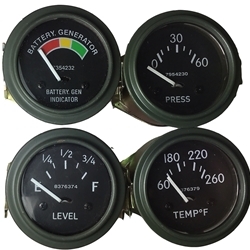 This is a full set of 24 volt gauges which are good quality reproductions. The set has a voltmeter which is good for use with a solid state voltage regulator & a 0-60 oil pressure gauge. We have other combinations available too.